Conservation works of the Caryatids, the Kore from the south porch of the Erechtheion temple. © Acropolis Museum. Photo: Giorgos Vitsaropoulos. 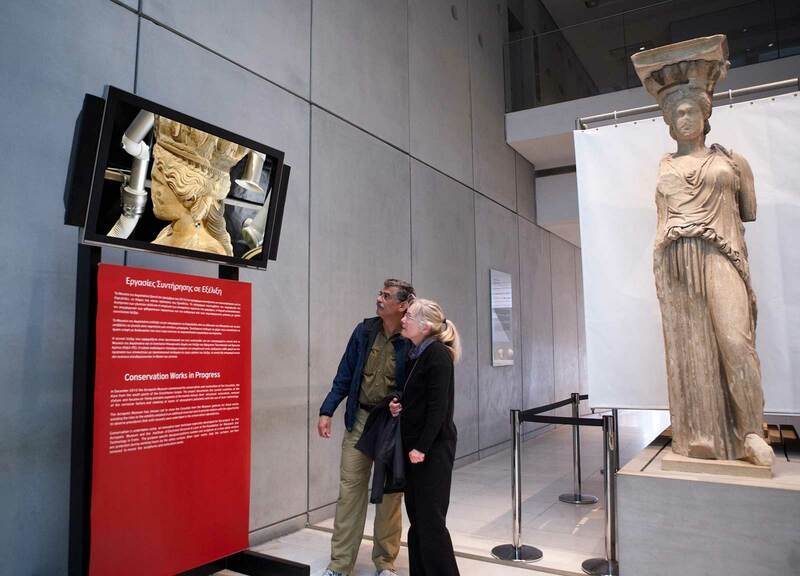 On Friday 14 September 2012, the Acropolis Museum was awarded by the International Institute for Conservation (IIC) in Vienna, with the Keck Award 2012. The award concerns the conservation and restoration of the Caryatids, the Kore from the south porch of the Erechtheion temple, with the use of laser technology. In 1994, the IIC Council announced the establishment of the IIC Keck Award, generously endowed by Sheldon and Caroline Keck, pioneers of art conservation. The award is presented every two years to ‘the individual or group who has contributed most towards promoting public understanding and appreciation of the accomplishments of the conservation profession’. 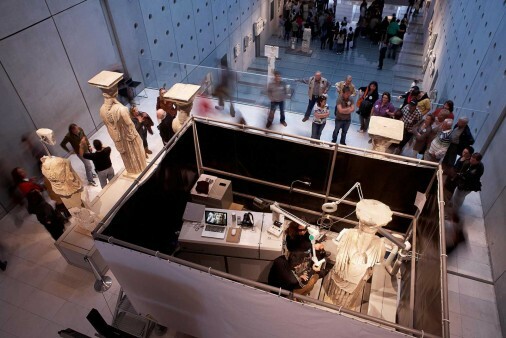 The award relates to the Acropolis Museum’s successful approach in providing visitors the opportunity to observe procedures that until recently were undertaken in the conservation laboratories. Since December 2010, more than 2 million visitors followed the work of conservators, participating not only in a highly interesting process, but also in unique historical moments. Conservation is undertaken using an innovative laser technique especially developed for the project by the Acropolis Museum and the Institute of Electronic Structure & Laser at the Foundation for Research and Technology in Crete. The purpose specific designed platform isolates the sculpture and visitors are protected against radiation by the safety curtains. Visitors can follow the conservation work carried out behind the protective curtains via a camera connected to a monitor outside the laboratory platform and a recording of this process is displayed on the monitor.